The WCDE-4-4X90LTL-LED mobile light tower from Larson Electronics is a towable, self-contained LED light plant powered by a water cooled diesel engine turning a single bearing 4 pole generator which produces 6,000 watts at 120/240V @ 60Hz. The four 100 watt LED lamps included with this unit produce a combined total of 54,000 lumens, which can illuminate a 3-4 acre area. This 400 watt LED lighting package is a direct replacement for metal halide light plants. This trailer mounted light tower and generator set comes equipped with a 30 gallon fuel tank that will run continuously without refueling for up to 120 consecutive hours. The WCDE-4-4X90LTL-LED mobile light tower is a self-contained towable light tower package that produces enough light to illuminate an area up to 4 acres in size. This unit contains a water cooled diesel engine powering a 6,000 watt generator, which supplies the current to four 100 watt LED lamps producing 13,500 lumens each for a combined total of 54,000 lumens of light. This unit can run uninterrupted for 120 hours straight without refueling and includes a telescoping light mast which can elevate the four LED lamps to a height of 25 feet. This mobile floodlight package is ideal for emergency services, large scale event illumination, construction, mining, industrial operations and anywhere an extended operation capable mobile lighting solution is needed. 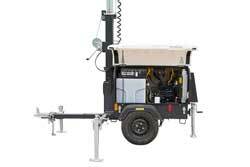 The WCDE-4-4X90LTL-LED mobile light tower incorporates a long list of impressive features. The diesel engine is a water cooled Kubota that operates at 1800 rpm. This engine features key operated electric starting, a full twelve volt electrical system, automatic low oil pressure and high temperature safety shutoffs, dual fuel filters and easy access oil and radiator drain ports to facilitate maintenance. A 30 gallon fuel tank allows the engine to operate for 120+ hours continuously without refueling. 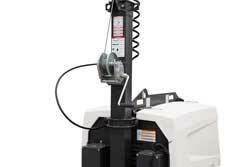 The 6,000 watt generator is a single bearing design and produces 120 volt current at 60 Hz. The generator uses a four wire hookup system with an external ground allowing for setting up both electrical and mechanical safe grounding systems. Lights: The lighting system on this unit is comprised of four 100 watt LED lamps producing 13,500 lumens of light each attached to the end of the telescoping light boom. These floodlights produce a wide flood light pattern capable of illuminating 4 acres with a combined total of 54,000 lumens of light. Each floodlight is securely fastened to the light boom and each lamp includes a support bracket to help maintain lamp stability within its housing. The lamps are connected to the power source via a water tight male pin connector that attaches to a receptacle located on the end of the telescoping boom. Heat Management: Heat is the single largest factor in premature LED failure and color shifting. These LED units feature individual heat sinks per bank of six LEDs to control heat buildup rather than utilizing a single housing to dissipate heat. This allows for more thorough cooling of the LEDs for extended operating periods. 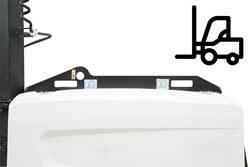 This allows the LEDs to be driven at up to 90% capacity without overheating or visible loss of light output. The end result is more light with less heat and longer LED life with an average 70% lumen maintenance after 80,000 hours. In addition, should an LED failure occur, these LED flood lights are field serviceable. Each bank of six LEDs can be replaced with the fixture installed. This allows for the tower to stay in operation until repairs can take place, and eliminates the need to remove and disassemble the entire fixture for repairs. Durability: As well as unparalleled heat control, the GAU-LTL series of LED lights from Larson Electronics also offer IP67 rated construction that is designed to withstand extremes of environmental and operating conditions. These units can withstand rapid temperature changes of -40° Celsius to +80° Celsius, are waterproof, and resist ingress of dust, dirt and humidity. The housings are formed from die cast aluminum and the optics are high transmission PMMA with 98% light transmittance. The Cree® LEDs help these units achieve resistance to vibrations and are rated at 70% lumen maintenance after 80,000 hours of use. We use these LED lights for applications where a lot of vibration, dust, dirt, dampness and abusive working conditions are encountered. 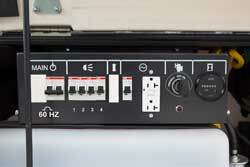 Controls: The operations system for this unit is a centrally located control panel within the light tower enclosure. Four circuit breaker protected switches allow individual control of the lights while an individual hour meter tracks unit operating time. Also included is an alternator warning light, fuel primer system, preheating switch, and a 120 volt GFCI duplex receptacle for auxiliary power takeoff. Telescoping Boom: The telescoping boom consists of three sections extending up to 25 feet through the use of two manual self braking winches and allows for rotating the lights 360 degrees. One winch is mounted to the trailer tongue and acts to raise the tower into a vertical position while the other is mounted to the boom and is used to extend the tower to the desired height. The telescoping boom is constructed of galvanized steel to resist rusting and corrosion and is capable of withstanding 51 mph winds when extended to its full height and the stabilizing outriggers are deployed. The stabilizing outriggers are a three point design with one located under the trailer tongue and two on the rear sides of the unit. The two rear outriggers are adjustable and include 1,000 lbs. swivel jacks for leveling and stabilizing the tower. Housing: All of the operating components are housed within a protective compartment constructed of recyclable LMDPE (linear medium density polyethalene) plastic. This material is extremely corrosion resistant and retains its orignal appearance even after years of use. The enclosure is high impact crack resistant and retains resale value for longer than metal counterparts while also minimizing environmental impact. The highly durable plastic material is fully UV stabilized, contains long term antioxidants and is resistant to both high and low temperatures. The plastic enclosure of the WCDE-4-4X90LTL-LED is significantly lighter than comparable metal enclosures while offering a more attractive appearance. A vertical lift door provides access to the interior while latches provide secure closing while the unit is in use. The entire unit can be loaded and unloaded onto trucks via forklift sleeves mounted to the outer section of the light mast. 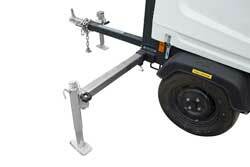 The entire unit is mounted onto a two wheel trailer with a 2,000 lbs. leaf spring axle. A standard two inch ball coupling, three inch pintle hitch and two standard safety chains allow for easy hookup and towing.